Last night, Dan and I enjoyed the most recent iteration of the Lost Horizon Night Market, an undercover art event that takes place in desolate industrial corridors of New York and San Francisco/Oakland. At the Night Market, differently-themed box trucks gather in the dead of night at a location that isn’t disclosed until 24 hours prior. All of the organizing occurs via email; there isn’t an official website, Facebook, or Twitter page. It’s unclear how long the Market can go on without attracting notice from city authorities, as it brings hundreds of people together without a permit. Fortunately, organizers seem to have succeeded at picking locations where the Market can take place unmolested. Below are reviews of some of my favorite trucks. There were many more, but long lines made it impossible for us to see them all. 1. The OuterBody Experience. This rig enabled you to see yourself as others saw you, destroying your sense of spatial orientation in the process. The participants wore goggles connecting to a live video feed of themselves, all the while competing to solve a puzzle that involved stacking differently-colored cubes to match a fixed pattern. 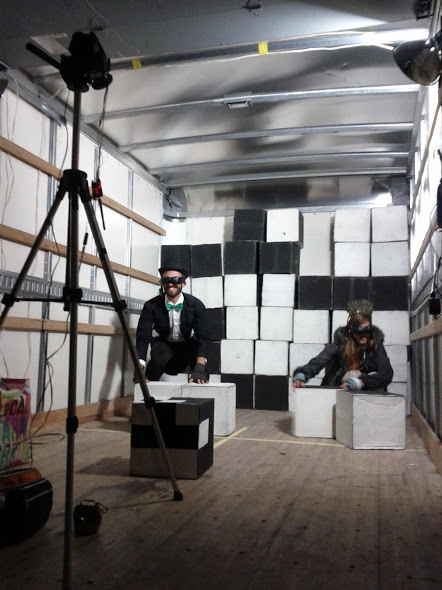 A man and woman race to solve a puzzle at the OuterBody Experience truck. 2. Bad Reagrets Tattoo Parlor. Exactly what it sounds like. The truck is lined with drawings of sample Bad Tattoos for inspiration. 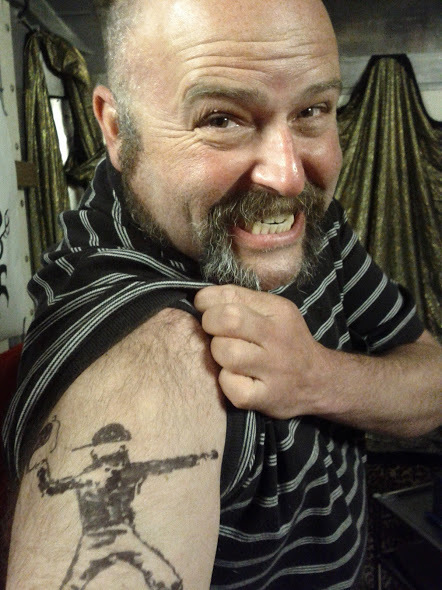 Full of incipient regret, I shuddered as a mustached man tattooed a bleeding “Octo-Cat” in the worst possible location (my calf), while a hideous buzzing emanated from his instrument. Receiving an ill-fated tattoo from a shady character at Bad Reagrets. 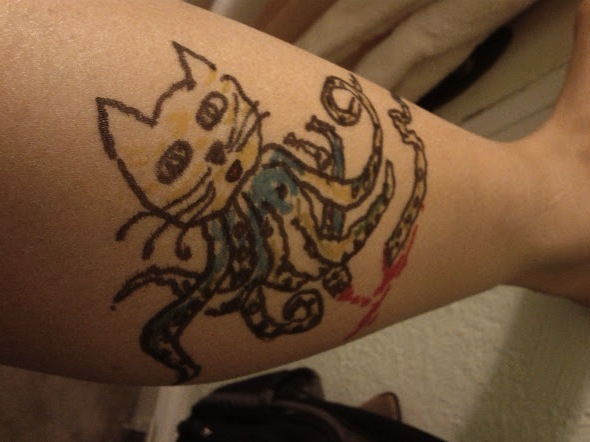 A highly questionable “Octo-Cat”, complete with severed tentacle. Another Bad Reagrets customer, seemingly satisfied. 3. Pain Pong. A simple yet satisfying concept. Four of us went in, with helmets, 3D glasses, and white lab coats emblazoned with chemistry formulas and the insignia of the Lunaria Alcohol Space Administration. We were each provided a supply of ammunition (3 ping-pong balls) and a highly inadequate ball gun. Then, as lights strobed and agitated music played, we attempted to shoot the balls through a small opening in the back of the truck. Eventually, after getting the ball through its target a second time, a series of tubes returned fire upon us, pelting us (gently) with ping-pong balls. 4. The Elsewhere Philatelic Society. Having participated in the Jejune Institute, I had an inkling that the Elsewhere Society was not what it seemed. On the surface, it seemed to be a civic-minded organization of mail carriers, enabling you to write postcards to other box trucks or apply (via typewriter) to become a postcard courier. 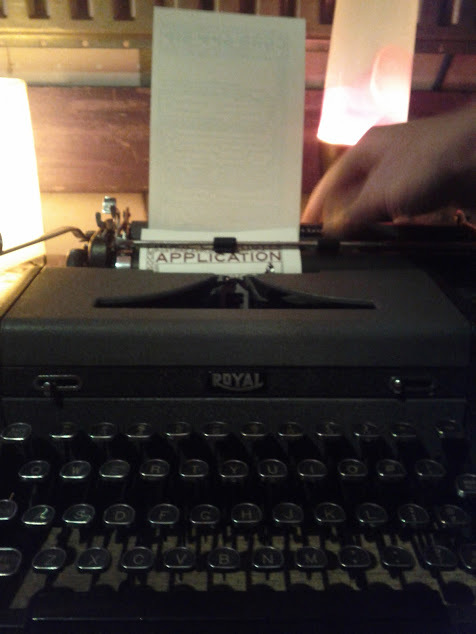 I sat down at a typewriter with my application, but almost immediately despaired, finding it impossible to properly position the keys. I also noted that the Elsewhere organizer was rejecting other people’s applications, even after they’d succeeded in filling them out. It seemed as if a phone number at the bottom of the application* might clue me into the Society’s motives, but sadly my phone was out of juice. During the night, I had witnessed a tense exchange between someone in a mask and another wearing a horse’s head. The masked man resembled an image that I’d previously seen in the Elsewhere truck. Looking back, the masked man was probably a member of the Numismatic Society, while the other person was a Philatelic agent. I imagine that the conflict between the Societies only intensified as the evening wore on and they recruited participants to their respective causes. I was sad to have missed it, but was pleased to know that someone is continuing the Jejune Society’s recondite legacy. Typing up the Elsewhere application. 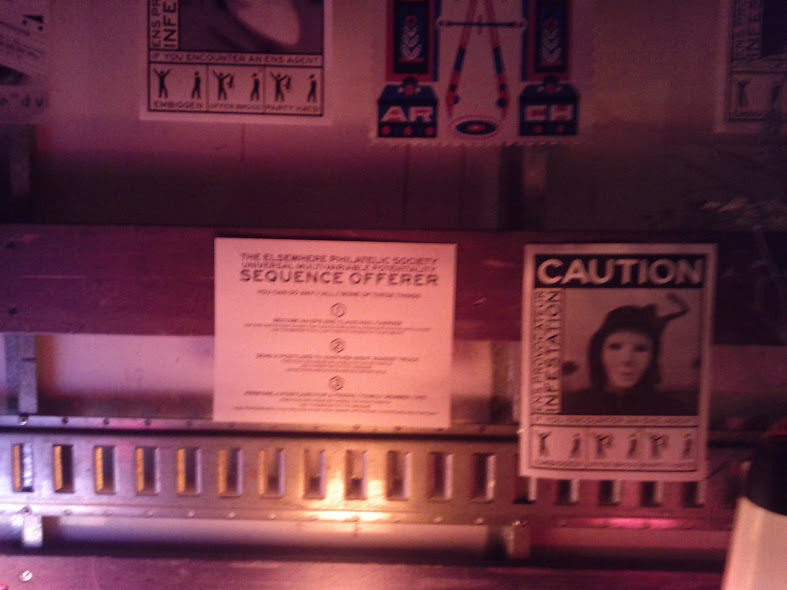 Mysterious signage at the Elsewhere truck. 5. 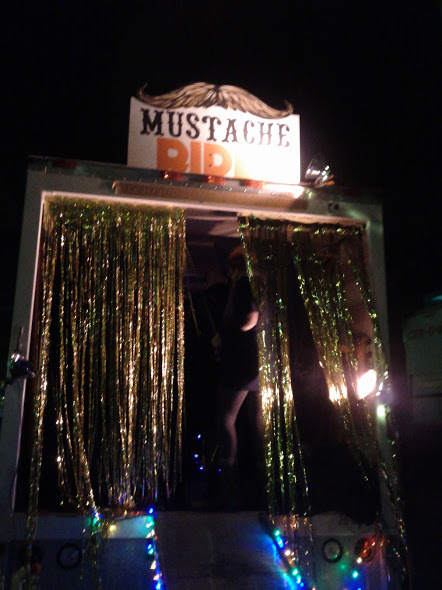 Mustache Rides. A wild romp! Dan and I rocked back and forth on a fuzzy, vibrating mustache, as others urged us on by beating us with a stuffed fish. We would have rocked it harder, but we were afraid to break it so early in the evening. After creating a Tactile Maze for one of last year’s Night Markets, I’ve spent some time thinking about what makes for a good box truck experience. The most enjoyable trucks seem to be ones that are highly interactive, engage several participants at a time, and require no more than 3 minutes to complete: Pain Pong is a canonical example. It may be best if audiences can look inside the truck and have a sense of what’s happening, since that defuses the anxiety of waiting in line. If the truck has to be closed off, then some other approach should be taken to enable audience participation. A good example of this is the “Smash Truck” from last year — organizers asked the audience riddles, and those who answered correctly were permitted to enter the truck and smash large quantities of china. Finally, while not strictly necessary, it’s nice to have at least one truck that gets the entire community involved, like this year’s Elsewhere truck or last year’s Mission: Impossible truck.